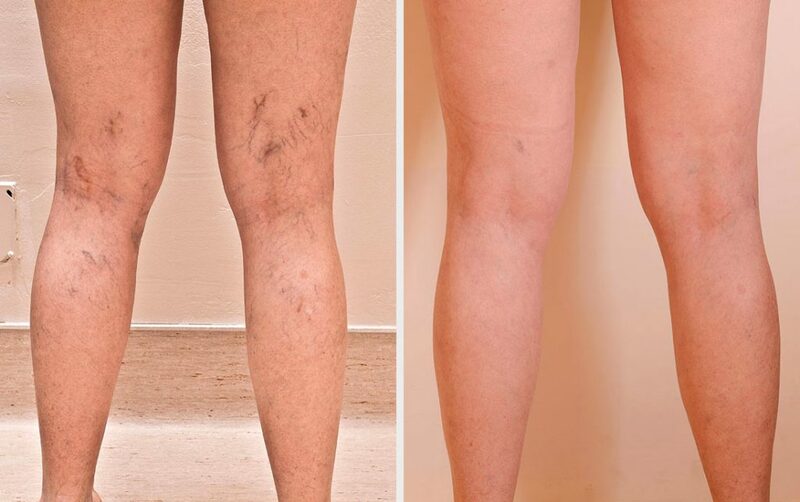 Sclerotherapy is a treatment for removal of spider and larger veins. A solution of sugar, salt and water is injected directly into the vein. The solution irritates the lining of the vein and causes it to swell shut. Redness and welting over the treated area disappears within twenty-four hours and the veins slowly fade over six weeks. Depending on the size and number of veins to be treated usually more than one session is necessary. A typical treatment takes 15-20 minutes with approximately 40-50 injection sites. A very small needle is used to inject. The majority of clients find the procedure tolerable however some may experience a temporary burning sensation. The injection sites will be covered with a cotton ball and tape that should stay on a few hours. Depending on the size and severity of veins treated it may be recommended to wear support hose or we will wrap your legs in a tensor bandage that should remain on until the evening. For the most part genetics play a large role in developing veins. If your mother or father has had a problem with their veins you will have a strong tendency towards developing them. Contributing or aggravating problems may include pregnancy, obesity, hormones and standing for extended periods of time. It is recommended that a 20 min brisk walk be taken after the treatment. Vigorous exercise (jogging, high impact aerobics) should be avoided for a couple of days. Avoid hot baths, whirlpools and saunas for 48 hours. Broken veins and Capillaries on the face are not dangerous or life-threatening, however they can certainly affect appearance and your self-esteem. Facial veins can make the face appear slightly bruised and are likely to get worse over time if left untreated. What Causes Broken Blood Vessels? The face has an extensive network of veins and tiny blood vessels called capillaries. Over time, aging, traumas, sun exposure, and certain lifestyle factors cause a number of them to break appearing as red streaks of blotches on the face. IPL therapy can eliminate damaged veins and capillaries by removing virtually all traces of these unsightly blemishes. What is Intense Pulsed Light IPL? IPL stands for intense pulsed light. The machine contains a flash lamp; this is an extremely bright light source. IPL technology is a treatment break through that can correct a variety of benign skin conditions, such as birth marks, sun spots, facial veins, unwanted hair and signs of aging. You can take some steps to prevent broken capillaries. Be gentle when you wash your face and use warm water. Apply sunscreen to your face, particularly around your nose and mouth, when going outside. Don’t abuse alcohol. While these measures won’t prevent broken capillaries in every case, they can help minimize the chance that you’ll develop them. A cold gel is applied to the area to be treated. The smooth glass surface of the IPL hand piece is gently applied to the skin and pulses of light are applied. Treatment is generally administered in a series of procedures that provide excellent results. Skin must be kept as pale as possible by wearing sun protection cream and avoiding sun exposure before and during your course of treatment. People with rosacea flush easily and can develop redness, pimples and thread veins on their cheeks nose and forehead. It usually starts in the second or third decade of life, it affects about 10% of adults. Because Rosacea affects the face it can cause significant psychological problems. The unpredictable flushes can cause a lot of embarrassment and anxiety. Flushing is exacerbated by hot spicy foods, alcohol, sunlight, extreme environmental heat or cold, and certain cosmetics. The active flare ups when spots break out are best treated with antibiotic creams or tablets. 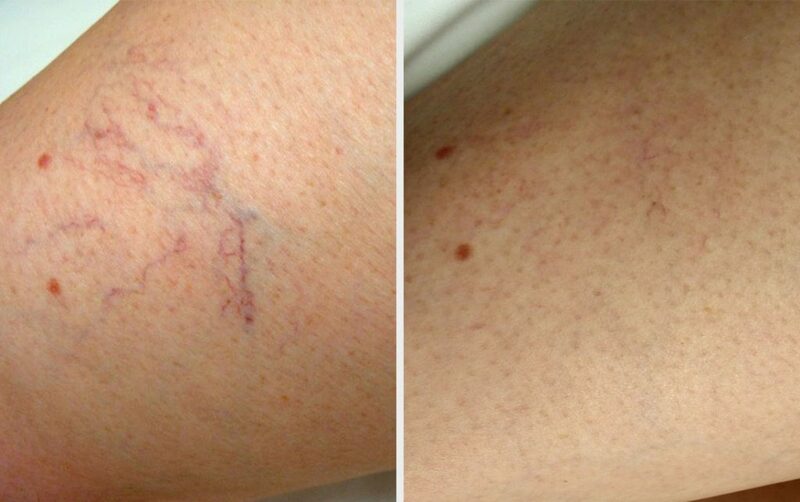 IPL lasers are used to treat the redness and broken veins.